Jeff’s Boat Tops has been custom making boat tops and covers for the Cincinnati Tri-state area for the past thirty-five (35) years. We pride ourselves on quality, care, and expertise. We personally come to your location and measure your boat to create a perfect fit. We custom tailor to the individual’s needs and use only high quality materials that are designed to last. Our most commonly used fabrics consist of Sunbrella, SeaMark, Top Gun, Aqualon and Crystal Clear 20/20 and are available in a variety of colors. We fabricate and install boat tops for virtually any model or size of boat, focusing attention on personal detail and customer satisfaction. Cockpit covers have been very popular over the years. These covers simply snap into place and create a tight fit that protects the interior of your boat from the destruction of nature. 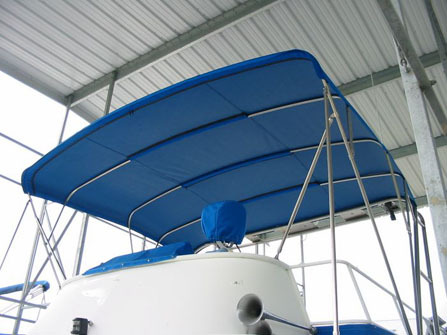 Jeff's Boat Tops offers a style of bimini top to fit virtually any boat. These free-standing tops allow maximum visibility while enhancing the look and comfort of your boat. Each bimini top is manufactured one at a time, by hand, using the finest quality fabrics & craftsmanship. Frames can be made of either aluminum or stainless steel tubing. 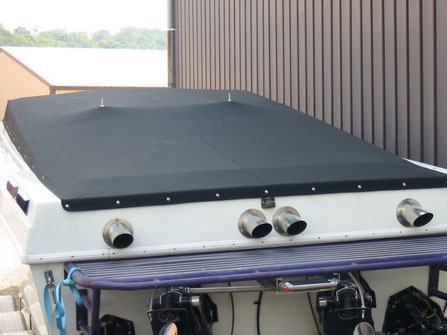 Jeffs Boat Tops is the premier fabricator for boat covers, cockpit covers, bimini tops, and pontoon covers in the Cincinnati Tri-state area, cover Indiana, Ohio, and Kentucky.